Playing in the park, rustling through the leaves along nature trails and splashing through the local stream in search of salamanders - these are some of the fondest memories of childhood for many people. 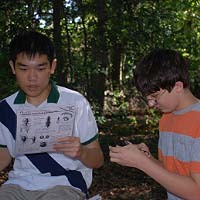 But they'd be little more than a pipedream for hundreds of Fairfax County children if it weren't for Northrop Grumman's generous grant to the Meaningful Watershed Education Experience (MWEE) each year at Hidden Oaks Nature Center. "Northrop Grumman believes that we build a stronger community by supporting efforts that focus on STEM (Science, Technology, Engineering and Mathematics) and foster a better understanding of our environment," said corporate spokesperson Karen Goetz. The MWEE project engages fourth and seventh grade students in a hands on, educational field trip that focuses on the importance of the Chesapeake Bay Watershed. The objective is to increase each student's understanding about the causes and consequences of watershed pollution and to teach them how to be good stewards of natural resources. "Many of the students are from low-income families and have never visited a park or even planted anything before," said Hidden Oaks assistant manager Suzanne Holland. "This program gives them direct, hands on experience of engaging with the watershed and learning how they can make a difference in ensuring healthy ecosystems." With the MWEE experience, classroom lessons come to life as students experience what it takes to remove invasive plants and replace them with native plants to benefit birds and other wildlife. They see for themselves why a healthy watershed is important for species that live there. "Seeing a crayfish is a massive big deal to them, because they've never seen that before," Holland said. And they learn that even an individual student can play an important role in maintaining a healthy environment by being better stewards of the watershed. "Thanks to Northrop Grumman's generosity, the students get to work alongside environmental specialists, urban forestry experts and master naturalists, and they leave feeling good about the work they've done and the lessons they've learned." Holland said. "The experience resonates and sticks with them, which could inspire their interest in an environmental science career."